You can always enjoy the best rates and flexible bundles with Zong. Talking, surfing or surfing whatever interests you; Zong is giving all these services in a single package at just Rs 150 inclusive of taxes. Call setup charges as per call will apply. Stay connected with your Zong friends with 500 on-net minutes. Now also make calls to all other local networks with 50 off-net minutes. Get 500 SMS to chat to all local networks in Pakistan. Upload your pictures, video calling or anything you want to do because Zong is giving you 500 Mbs of mobile data. Weekly all in 1 offer is giving you a single pack of minutes, texts, and data with a validity of a week so subscribe this offer now by dialing *6464* and press 4 then choose next options accordingly. You can also type “Weekly150″ to 6464. Hold up until you get a confirmation message. 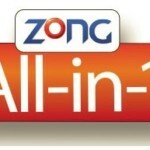 Only prepaid customers of Zong can avail this offer. All resources are allocated for a week. Default call setup charges of Rs 0.15 + tax will apply. This offer is auto-renewable; it will automatically renew at midnight of the seventh day if you have enough balance. On consumption of allocated resources or expiration of the offer, default rates will apply. Provided mobile data is for 2G, 3G, and 4G users. FED and withholding taxes will apply on the bill, recharge and other on usages. To deactivate the weekly all in offer just dial *6464# and press 4 then select the weekly bundle from the list and reply with 3 for successful deactivation. You can also send SMS by typing “Unsub weekly 150” and sending it to 6464. You will receive a confirmation message for un-subscription. 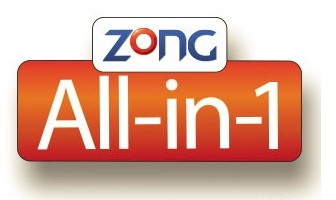 Zong is number one choice for cheap data, SMS and both on-net and off-net calls. Zong continues to deliver the best possible services to their customers because they know how important is to stay in touch with each other. Weekly all in 1 offer is the best opportunity for you to avail all services at minimal rates. Go and subscribe to this offer now!